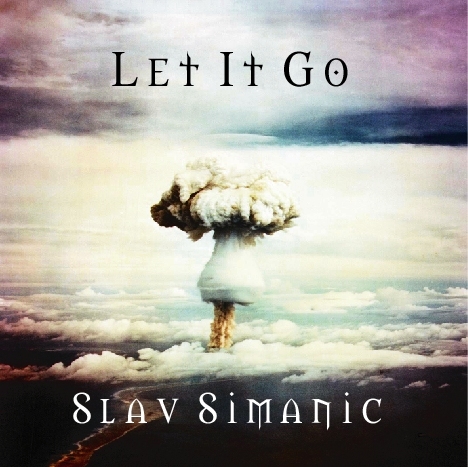 Although I have to admit to not being familiar with the name Slav Simanic, the name of the lead singer on this release was very familiar. Phil Naro's the name and 24K is where I first came across him. A man who's voice changes character with each and every song he features on. At times his voice sounds so different I have to check it's still him singing on not another person come in to do the duties on that track. Having read through the insert sleeve I now know that Slav is in fact the guitarist on this album, and a hugely talented one at that. Why have I not heard of him before? Hailing originally from Smederevo, Yugoslavia, and more recently Toronto, Canada, Slav brings forth this offering which is more a journey of discovery and self belief than anything else. In fact the first paragraph in the insert sleeve actually states ... 'The album "Let It Go" was made as a result of my exploring the Holy Scripture and experiencing the message of God's precious Gospel. I guess that means he's finally found some inner peace with himself and his role in God's work because he's managed to capture these feelings in this epic adventure. He's not a religious nut though, oh no, he's just a happy man who isn't afraid to share the wisdom of the Lord's work with his fellow man. It's been a long time since I've come across such an impressive Christian Rock Band. If you're looking for a genre then Progressive Rock would probably be the best description of this young mans music. Having said that there's some pretty hard rocking tunes on here. For instance they don't come much heavier than 'The Fallen Angel'. Religion is a very personnal thing and something that for a large part gets people's backs up if it's preached to them in their music. However considering the amount of 'adventure/epic tales' albums out there in the Progressive Rock market at the minute, I don't see why this particular album should be treat any differently to them. Instead of singing about dragons and vikings, Slav's bringing forth a far more exciting journey to you. There's never been a more action packed and thrilling story than that of Our Lord. Good on you Slav. You've done a very brave thing here and you've done a wonderful job of it. The words you've put together in the songs are so beautiful and meaning. You've captured the essence of what really matters. 'Promised Land' is my own favourite track off the album. Mixed and mastered by Emerald Rain's Mike Dmitrovic, the European release of this album includes a bonus CD of Slav's first solo album 'Water of Life'. An intense, aggressive hard rock/metal album which again spreads the good work of the Lord.